When the tree is rendered the CASE compares the currently processed node (EMPLOYEE_ID) with the current active record (P4_EMPLOYEE_ID) which is displayed in the form. If the IDs match, it wraps the LAST_NAME column with a SPAN which contains some styling information. View a working demo of the example. This entry was posted in Tips & Tricks and tagged Tree by Patrick Wolf. Bookmark the permalink. I’m a big fan of your articles. Very helpful. I’m having strange problem with trees in a sidebar display point. 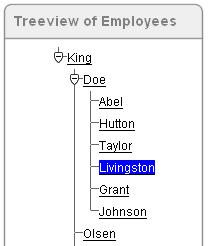 Does anyone have experience where a tree is always blank in a sidebar (or any particular) region? Apex 3.0.1.00.08 – Sand theme. I will do the follow-up on the OTN forum. Quick question.. Can yo udo a tooltip on a dhtml tree?? I mean the items in the tree, to show a small description of the menu item? I am new to APEX,I am trying to implement Menu as TREE into my Application,so as per your above instruction i successfully complete the my page.but now i want that tree menu is seen on all page of my appliaction on left side.but when i creating second page and give the source of other page item,it show tree only in one page.becuase on shared component tree item source is change. is there any way to assign the runtime tree into variable. Nageeb, is this a question?